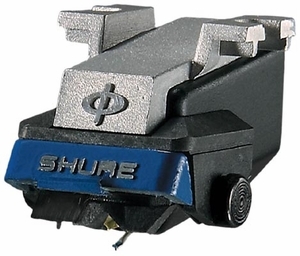 Shure�s exclusive viscous-damped Dynamic Stabilizer, which maintains a uniform distance between the cartridge and the record under difficult playing conditions, such as those caused by warped records, or mismatched tonearm mass. When such stabilization is not required, the stabilizer brush can be locked up into its detent position, which, under ideal playing conditions, can provide even better sound quality. A die cast aluminum mounting block for secure, vibration-free attachment to the tonearm. The SIDE-GUARD stylus protection system that helps prevent stylus damage if the cartridge accidentally slides across a record. This unique feature responds to side thrusts on the stylus by withdrawing the entire stylus cantilever and tip safely into the stylus housing before the cantilever can be damaged.